Are you half human? "No. I'm half filler". Still a decent box set though! 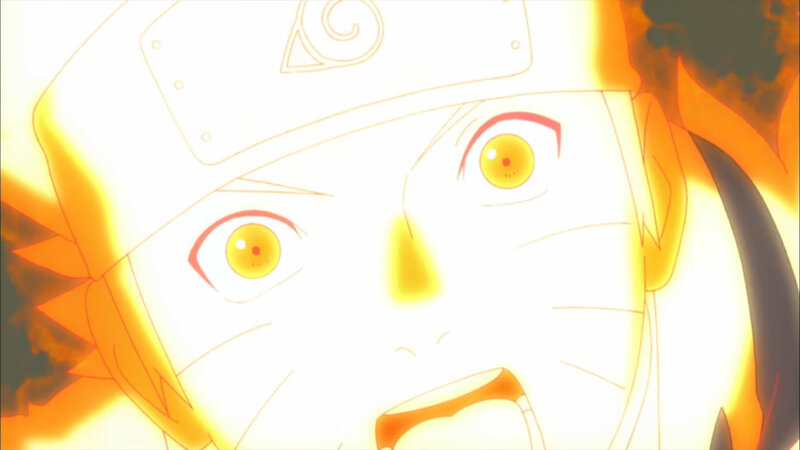 In our first official Naruto DVD release review, it’s an odd place to kick off our coverage. We’re met with a half canon, half filler episode box set, at which I initially shook my head in dismay, but ultimately had a positive reaction to it all. Please continue for our full Naruto Shippuden Box Set 24 Review. Having watched some of the Toei products lately, I have to say I’ve gained a new appreciation for the effort Studio Pierrot put in to animating Naruto. In this particular box set we see a series of fantastic fights in the first, canonical half. From Gaara’s fight with the resurrected Kage to Naruto and Killer Bee going up against resurrected Nagato and Itachi, it’s all remarkable. It’s not exactly movie quality, but it’s consistently great. Well above its long-running counterparts at this stage now that Bleach has faded away. Special mentions should be made for Nagato’s Planetary Devastation attempt. Watch all of that debris shift and twist in to the air as Naruto, Itachi and Bee get swept up alongside of it, resulting in a fantastic explosion following a triple-attack from the aforementioned. Not to mention the Mother Sand of Gaara. Truly iconic moments brought to life in the first few episodes of this box set. Of course, it’s not perfect. Once we find the filler half, the drop in quality is noticeable. We start seeing long-distance shots to save on detailing faces as well as missing mouth movements with dialogue from time to time. This is to be expected. I wouldn’t want them wasting too much money on filler, but I honestly wish they wouldn’t produce it in the first place. It brings down the overall experience, and though they are positives in the form of Hayate vs Yugao, it’s mostly a sub-par presentation that’s all the more bothersome having transitioned from some incredible moments done well. These episodes don’t do a great deal to move the plot forward, especially given that half of the episodes are filler, but it has its moments. Some of my favourite in the series, in fact, and we get to see a classic “we did this ages ago and now it’s paying off” scene. So we begin with Gaara meeting the resurrected Kage: Second Tsuchikage Mu, Third Raikage Ay (literally, just A), Second Mizukage Gengetsu Hozuki and Gaara’s own father; the Fourth Kazekage Rasa. 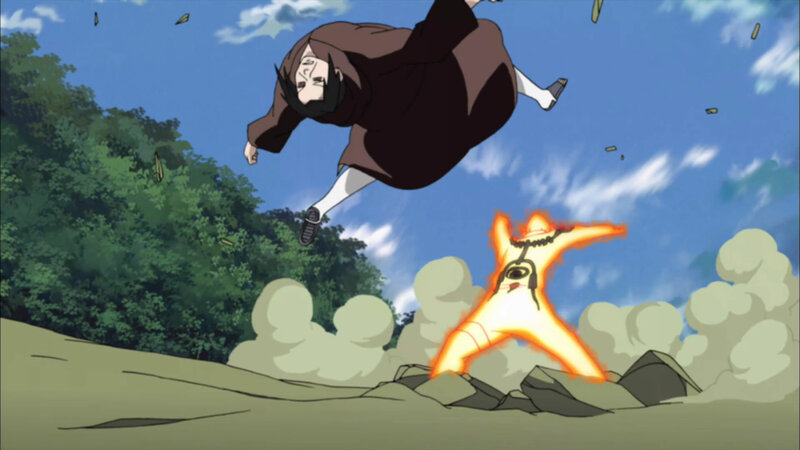 Here, Gaara and his father clash briefly, before Gaara proves himself to his father, outsmarting his gold-dust strategy and sealing him inside of a sand structure. As this is happening, Rasa informs Gaara that he ordered Gaara’s assassination and that he failed as a father in general. He’s sealed after telling Gaara that his mother always loved him. Something Gaara had always thought the opposite of because it was told to him through the one person he trusted as a child at the behest of Rasa himself to test Gaara’s potential as a Jinchuuriki. A truly touching wrap-up to Gaara’s tragic past, this is an opportunity that could only be afforded via the plot choice of the Edo Tensei which I’ve had mixed feelings on. This time, however, it hit home, giving Gaara closure on his childhood. Elsewhere, Naruto and Killer Bee are making their way to the battlefield. They encounter freshly zombie-fied Itachi and Nagato. Kabuto, controlling the Edo Tensei from a safe distance, decides to use this opportunity to capture the final Tailed Beasts in his own efforts to betray Madara. Naturally, Naruto and Killer Bee don’t wish to go without a fight, so a series of impressive bouts takes place until Itachi attempts to use Amaterasu. This leads to a crow emerging from Naruto’s mouth, placed inside of him in the early episodes of Shippuden by Itachi in a genjutsu. This crow holds the Mangyekyo Sharingan eye of Shisui Uchiha, the greatest genjutsu user that supposedly ever lived, and casts Kotoamatsukami on Itachi, breaking him free from the Edo Tensei control. 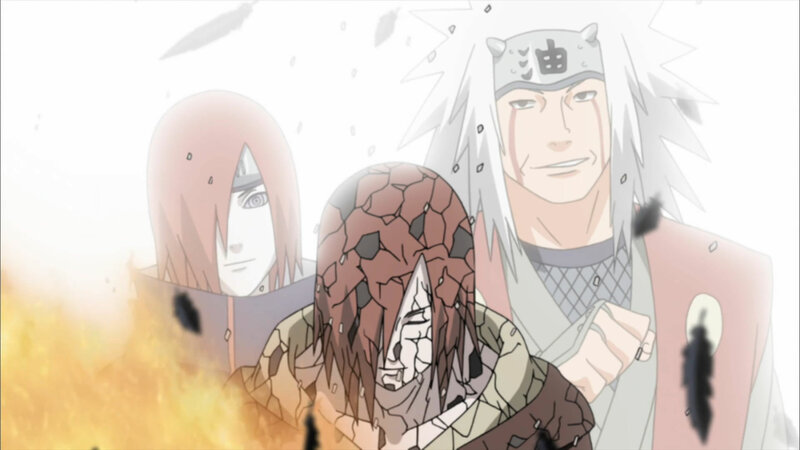 Nagato isn’t so lucky, however, and absorbs Bee’s chakra to strengthen himself and return to his youthful look. He then proceeds to trap Naruto and Bee, attempting to steal their souls until Itachi uses his Susano’o and the sealing sword, Sword of Totsuka, to render Nagato helpless and return him to his passed on state after a few words with Naruto, now having come to his senses. Itachi is flipping excited and Naruto can’t help but throw his hands up in the air sometimes. Afterwards, we get some important dialogue with Itachi, Naruto and Bee, wherein Itachi scolds Naruto for his insistence on doing everything alone now that he controls the Nine-Tails Chakra. He reminds Naruto that doing things alone is why he himself failed in his mission to protect the village, now having learned of Sasuke’s decision to take revenge on the Leaf, and tells Naruto that he has the soul of Shisui. The same spirit and belief in the world. He shows his faith in Naruto’s own power by burning Shisui’s eye – though his jutsu can only be cast once in a decade, so it was kind of useless – and leaves on his own adventure to undo the Edo Tensei jutsu being cast by Kabuto. 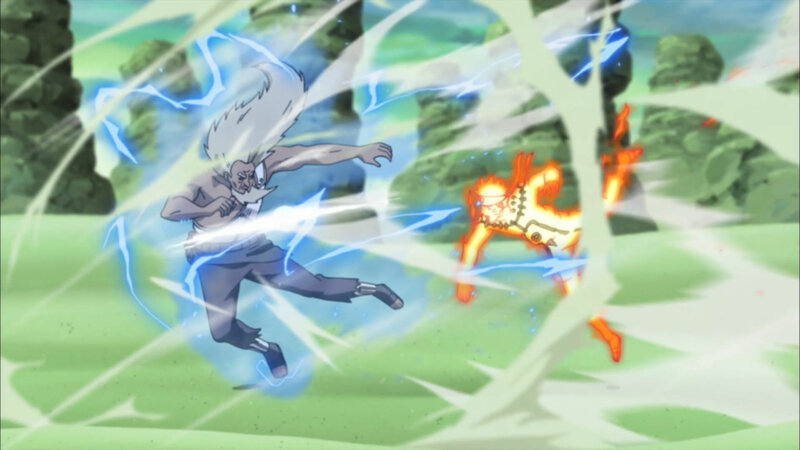 The rest of the canon involves a great fight with Naruto using Sage Mode against the Third Raikage, Gaara manipulating the gold dust in his own sand from his previous fight with his father to defeat the Second Mizukage and the particle style users go head to head with Mu vs Onoki. All are well done fights with meaningful ramifications on the war. 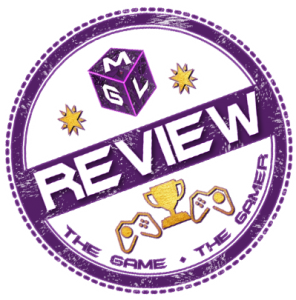 It’s great content and it’s paced well too. Of course, it wouldn’t be Naruto if it didn’t fill up a disc and a bit more with filler episodes. The good thing about the Fourth Great Ninja War is that they can have stories that make sense in that world and, overall, they manage that this time around. The Sound Ninja 4 return for revenge on Shikamaru, Choji, Neji and Kiba. Under-utilised in the actual canonical material, it’s good to see them get a little more screen time, but the battles are inconsequential as a result. Then there’s a brief aside with Neji and Hinata, as she recalls the time when Neji forced her to go temporarily blind by accident and miss the fireworks show. It displayed an affectionate side to pre-Shippuden Neji that I could appreciate, but again, it’s of no consequence as it only leads to Hinata thanking Neji for that time. An odd aside, but a nice little story with a bit of levity amidst the seriousness of the war. We then get an interesting filler based in the current goings on of the war when Hayate Gekko, formerly of the Leaf Village, is resurrected by Kabuto to retrieve fallen Shinobi for the purposes of reanimation. He encounters his former lover Yugao, and she struggles with the situation. The reason I found this filler interesting is that we get some canonical extension from it. Hayate was originally killed off-screen by Baki of the Sand during the Chunin Exams. In this moment, we see how Dosu of the Sound Village was killed by Gaara on the rooftops in full animation (originally done off-screen to hide Gaara’s Shukaku form). So Hayate was actually a meaningful character, having discovered Kabuto’s plans to ally with the Sand Village to attack the Leaf during the Chunin Exams, and he paid the ultimate price for it. His relationship with Yugao, a member of Anbu Black Ops at the time, is also canonical. Filler is always at its best when rooted in some canon and expanding on it. Which leads us to the final episode of the box set. Naruto encounters an unknown Samurai. Turns out, Naruto met him when he was young Naruto after an eating contest during a mission to kidnap a hostage. Honestly, it’s an odd filler. It has its funny parts, but it also ends abruptly, meaning not only do we end the box set on filler, but we don’t even resolve that filler, meaning it’ll bleed in to the next box set. How very disappointing. Though the box set ends on a downer, the canonical content in this is more than enough to justify a purchase and, in a rare twist, the fillers aren’t bad overall. 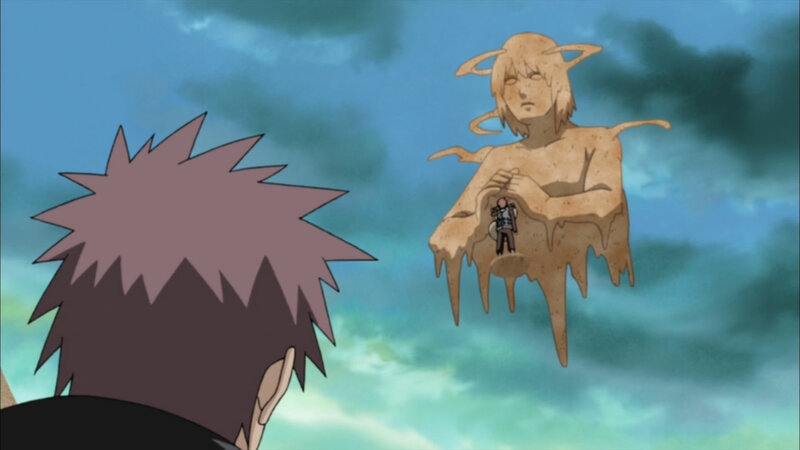 Rasa looks up at Gaara as his Mother’s Love protects him. Naruto’s Dub is consistently good. I’ve got zero complaints. Even in the filler, the voice actors do a good job. Of course, if you’re averse to dubs in general, there’s the option to switch to Japanese audio with English subtitles. As with most anime, it does feel more natural, but I don’t feel you can go wrong either way. This box set features some brief storyboards showing off the planning of the Gaara fight with Dosu. There are also some character designs for the filler characters. There are trailers, but they’re odd. The first is a trailer for Naruto Shippuden: The Movie, which is long in the past now, and a trailer for Naruto Shippuden in general. I’m currently watching Naruto Shippuden. I already know it’s on DVD. These trailer choices were peculiar. At a distance, it’s pretty simple: half of this box set is filler. If that concerns you, maybe you should wait for the entire season to be released, but fillers are coming in hard and fast with Naruto Shippuden, so waiting might put you behind a fair bit. Still, the canonical content in here is both awesome and important, even if it’s more a of a bridge to the upcoming events than anything else. Brace yourselves though; filler is coming.